Magickal squares are squares that are divided up into smaller squares with numbers residing in those squares. All of these numbers will add up to a specific number when you add together any row, column, or main diagonal. The number that they will all add up to is going to be the main intention, and energy of the square, and will be referred to as the magick constant. The magick constant is going to dictate what energy the magickal square is going to give off based on the energy of the metaphysical properties of that number. These magickal squares represent a specific energetic frequency in a mathematical format, and work a lot like other magickal symbols, and will invoke the energies that they are associated with when a representation of them is constructed. Its multiple associations with the numerology of the magick constant will allow it to call upon that numbers energy multiple times creating a powerful tailsman that can be used in magick. All you need in order to create these magickal squares is an understanding of mathematics, and numerology, through the combination of these two understandings a magical square can be born in set forth into the world. In order to use a magical square all you have to do is make a representation of it. You can do this by constructing it through the act of drawing, carving, or some other construction process. Once the magickal square has been constructed it will invoke the energy of whatever its magick constant is. This energy will be able to be interacted with, and will impact the vicinity of the magickal square. This can be incredibly useful, if you want to attract a certain energy to a specific place, so that you can work with it, or so it can interact with the environment. In order to stop a magickal Square all you have to do is destroy the representation of it. This will release all remaining energy from the representation which will eventually dissipate, and nullify the effects. These magickal squares can also sometimes be used as a way to create sigils. This is usually done by associating the letters of the intent of the sigil with numbers. 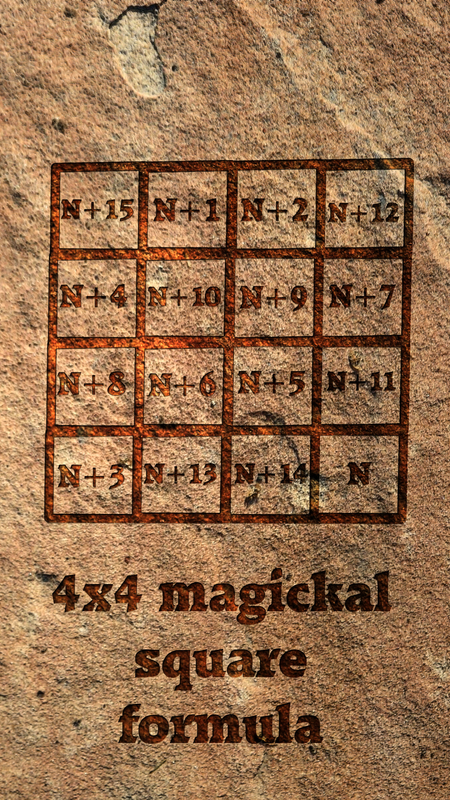 Then using those numbers to draw a line number to number on the magickal Square, so that a line sigil can be created. This line sigil will take on some of the magickal energy of the magickal square along with its own intent. This will give some more energy to the sigil, and will add to its intent as well. The first thing that you were going to want to do is to pick out a number that has the intention, and magickal property that you wish to invoke. This can be pretty much anything if you know how to find the correct number with the meaning that you are looking for. This will be done through numerology and will be based off the energy of the number. This number will be calm your magick constant of choice, and will be the number that is created by the adding up of any row, column, or main diagonal adding up to the magick constant. Once you have that number you can use a multitude of different methods in order to create a magickal Square. These methods will be mathematic formulas that when used correctly will create a magickal square that has any row, column, or main diagonal adding up to the magick constant. 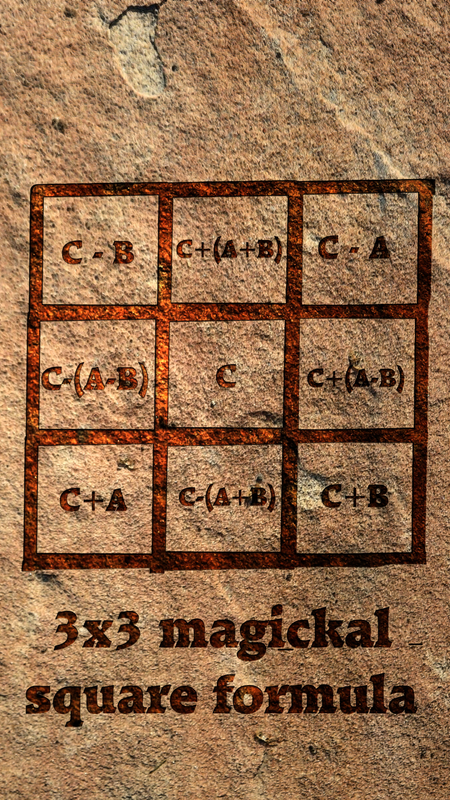 We are going to be looking at two methods in this post one for 3 x 3 squares, and one for 4 x 4 magickal square. For this you’re going to have to put numbers into variables. These variables being A, B, and C. ‘A’ must be greater than 0, ‘B’ must be greater than ‘A’, but cannot be ‘A’ squared. ‘C’ must be greater than ‘B’, while subtracted by ‘A’. Once you have those variables assigned you can fill in the formulas of the square below in order for you to create your 3×3 magickal square. In this method, I have not found a way for you to tell what magickal constant you’re going to end up with without testing for it by trial, and error. For this to work your magick constant of choice must be larger than 30. Once you are done with that your magickal square will be complete, and you can begin to use it using those methods I mentioned before. Good luck creating, and using your magick squares. I hope this was informative, and you found it helpful.